The Race. 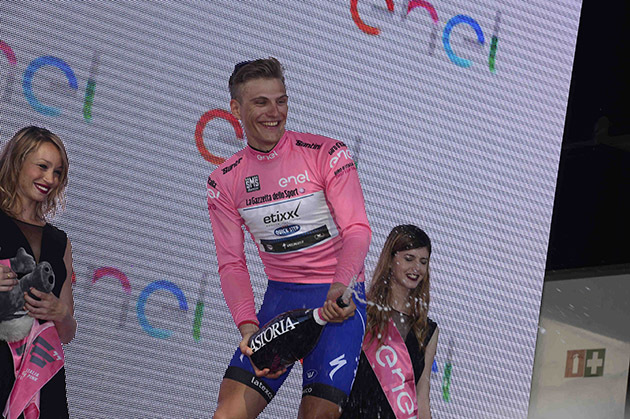 Here's Marcel Kittel's Etixx-Quick Step team report. 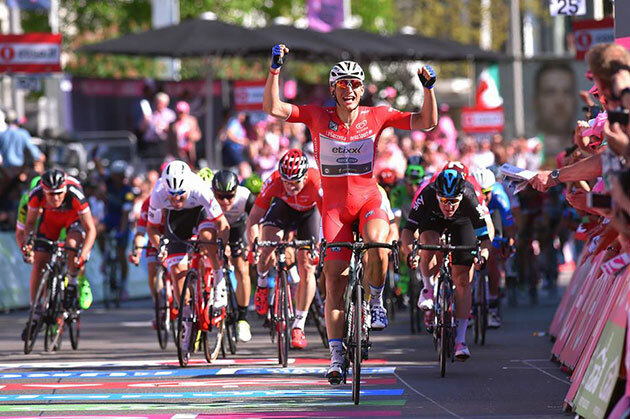 Marcel Kittel doubled his tally at this year's edition and became the first German in a decade to lead the race. 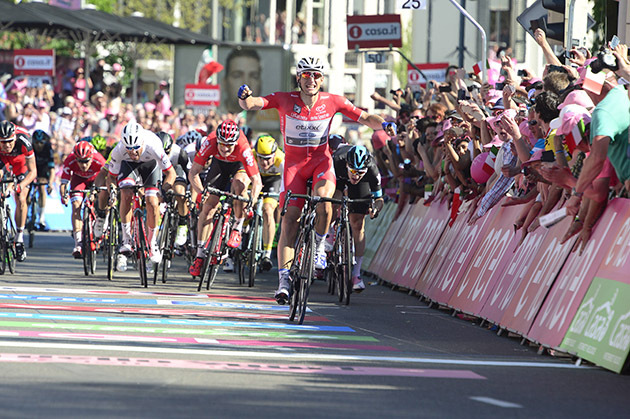 The opening week-end of the Giro d'Italia was owned by Marcel Kittel, who began his campaign with a top 5 in the Apeldoorn time trial, before going on to win both road stages which took place in the Netherlands. 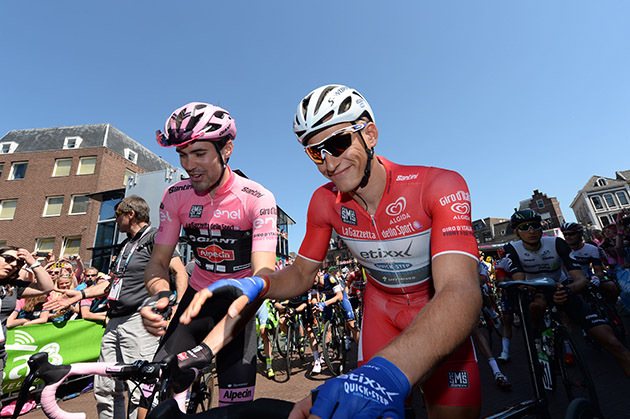 It was not only a fantastic display of strength from the 27-year-old, but also from the whole team, as Gianluca Brambilla, David De La Cruz, Bob Jungels, Fabio Sabatini, Pieter Serry, Matteo Trentin, Carlos Verona and Lukasz Wisniowski brought their valuable contribution to the successes Etixx – Quick-Step has enjoyed in Nijmegen and Arnhem. Unlike yesterday's stage, the one on Sunday was much nervous, because of the narrow roads and the strong crosswinds, which at one point, led to an important split in the pack. 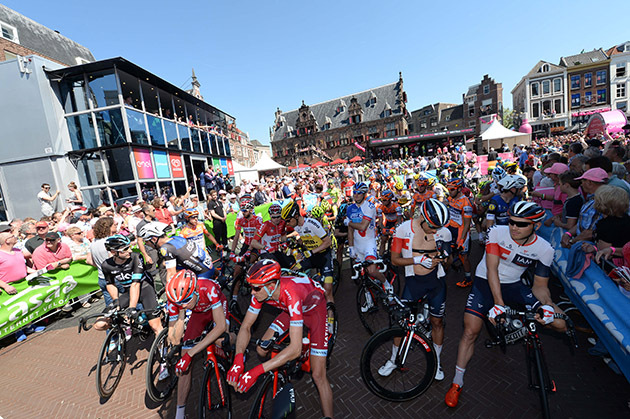 Despite of a gap that sat at half a minute, it was all back together for the final 50 kilometers, when the sprinters' teams went after the day's escape, which included Julen Amezqueta (Willier-Southeast), Giacomo Berlato (Nippo-Vini Fantini), Maarten Tjallingii (LottoNL-Jumbo) and Johan Van Zyl (Dimension Data). 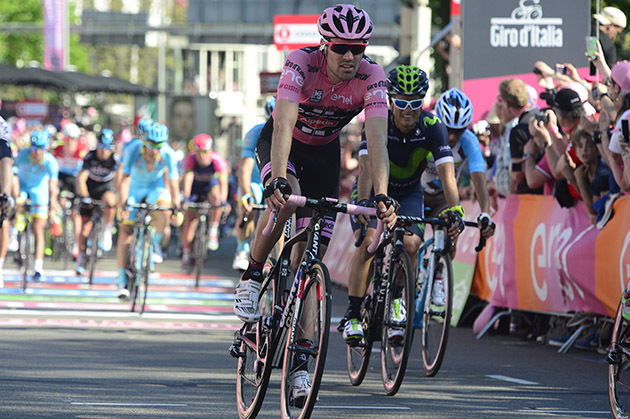 "Maybe today's stage looked easy looking on the roadbook, but it wasn't. There were small roads and crosswinds, so the peloton was nervous. Everyone tried to stay in the best position, it was a real fight out there. 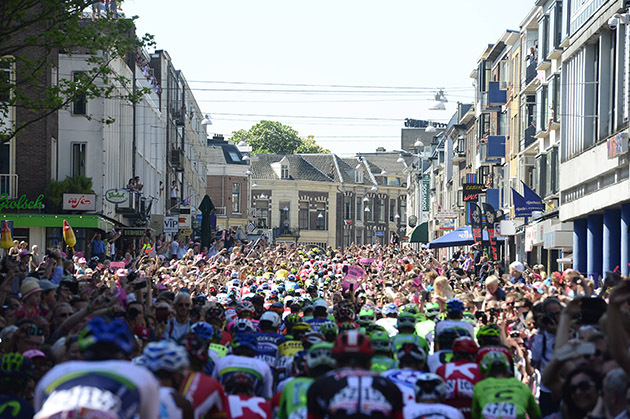 The team was super strong, went full gas at the end to close the gap on the last rider in the breakaway, and I must thank them for their fantastic work", said Marcel Kittel immediately after the stage. On Monday, the race schedules a rest day, as the peloton will head to the Calabria region for stage 4 between Catanzaro and Praia a Mare, a town which has never before hosted a Giro d'Italia stage. The course is undulating in the final 80 kilometers and will for sure give some ideas to the attackers, especially as the last climb – Via Forlino (1700 meters at a 7.7% average) tops with around 8 kilometers left. 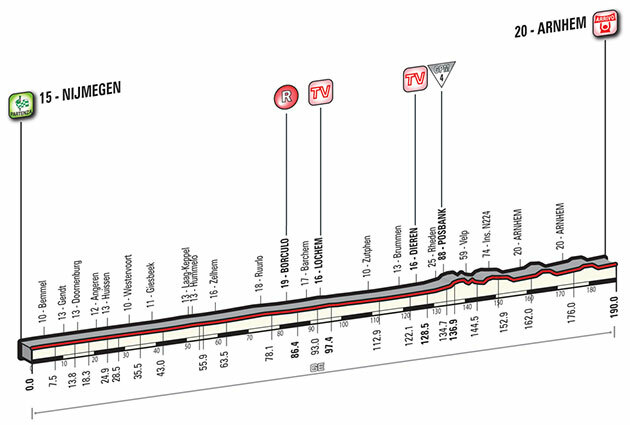 Still, with a non-technical descent followed by three pan flat kilometers, there is a chance to see the reduced peloton come back and fight for the win. 2 VIVIANI Elia SKY s.t. 4 GREIPEL André LOTTO SOUDAL s.t. 7 HOFLAND Moreno LOTTO NL-JUMBO s.t. 8 DEMARE Arnaud FDJ s.t. 10 MOHORIC Matej LAMPRE-MERIDA s.t. 11 BELLETTI Manuel WILIER TRIESTINA s.t. 12 EWAN Caleb ORICA-GREENEDGE s.t. 13 PELUCCHI Matteo IAM CYCLING s.t. 14 SIMION Paolo BARDIANI CSF s.t. 15 SAVITSKIY Ivan GAZPROM-RUSVELO s.t. 17 LUDVIGSSON Tobias GIANT-ALPECIN s.t. 18 RUFFONI Nicola BARDIANI CSF s.t. 19 ZAKARIN Ilnur KATUSHA s.t. 20 ZEITS Andrey ASTANA s.t. 21 PREIDLER Georg GIANT-ALPECIN s.t. 22 ZHUPA Eugert WILIER TRIESTINA s.t. 24 KLUGE Roger IAM CYCLING s.t. 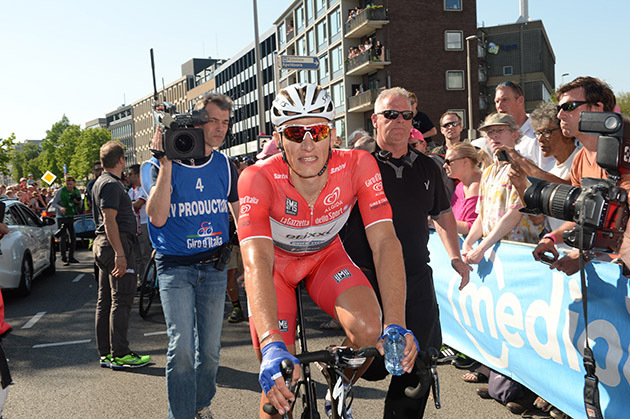 25 VAN POPPEL Boy TREK-SEGAFREDO s.t. 28 KNEES Christian SKY s.t. 29 MAJKA Rafal TINKOFF s.t. 30 VALVERDE Alejandro MOVISTAR s.t. 31 CHAVES Esteban ORICA-GREENEDGE s.t. 32 ROJAS GIL Jose Joaquin MOVISTAR s.t. 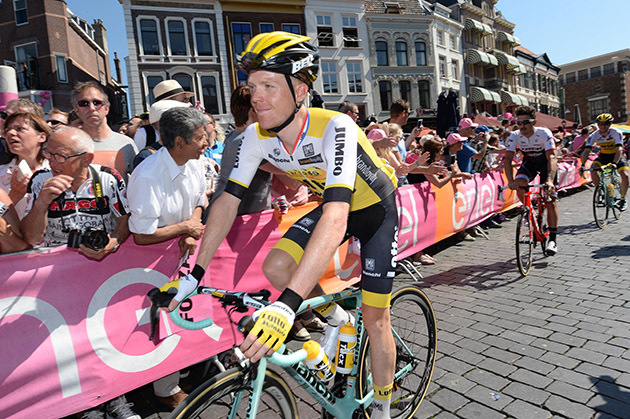 33 KRUIJSWIJK Steven LOTTO NL-JUMBO s.t. 34 DE BIE Sean LOTTO SOUDAL s.t. 35 TAARAMAE Rein KATUSHA s.t. 37 ULISSI Diego LAMPRE-MERIDA s.t. 38 SIUTSOU Kanstantsin DIMENSION DATA s.t. 39 BETANCUR Carlos A. MOVISTAR s.t. 40 POZZOVIVO Domenico AG2R-LA MONDIALE s.t. 41 HOWARD Leigh IAM CYCLING s.t. 42 KANGERT Tanel ASTANA s.t. 43 SCARPONI Michele ASTANA s.t. 45 ROCHE Nicholas SKY s.t. 46 FUGLSANG Jakob ASTANA s.t. 47 AGNOLI Valerio ASTANA s.t. 48 LANDA Mikel SKY s.t. 49 MODOLO Sacha LAMPRE-MERIDA s.t. 50 NIBALI Vincenzo ASTANA s.t. 51 JUNGELS Bob ETIXX-QUICK STEP s.t. 52 KOCHETKOV Pavel KATUSHA s.t. 53 BATTAGLIN Enrico LOTTO NL-JUMBO s.t. 54 POLJANSKI Pawel TINKOFF s.t. 55 URAN URAN Rigoberto CANNONDALE s.t. 56 CLARKE Simon CANNONDALE s.t. 57 VAN EMDEN Jos LOTTO NL-JUMBO s.t. 58 PETILLI Simone LAMPRE-MERIDA s.t. 59 ATAPUMA Darwin BMC s.t. 60 BRUTT Pavel TINKOFF s.t. 61 CARDOSO Andre Fernando CANNONDALE s.t. 62 AMADOR Andrey MOVISTAR s.t. 63 TANKINK Bram LOTTO NL-JUMBO s.t. 64 WISNIOWSKI Lukasz ETIXX-QUICK STEP s.t. 65 MONFORT Maxime LOTTO SOUDAL s.t. 66 BUSATO Matteo WILIER TRIESTINA s.t. 68 FORMOLO Davide CANNONDALE s.t. 69 PIRAZZI Stefano BARDIANI CSF s.t. 71 BERTAZZO Liam WILIER TRIESTINA s.t. 72 CONTI Valerio LAMPRE-MERIDA s.t. 73 MARTINEZ Daniel WILIER TRIESTINA s.t. 74 DE LA CRUZ David ETIXX-QUICK STEP s.t. 75 HENAO Sebastian SKY s.t. 76 HESJEDAL Ryder TREK-SEGAFREDO s.t. 77 KUNG Stefan BMC s.t. 78 KUDUS GHEBREMEDHIN Merhawi DIMENSION DATA s.t. 80 QUINZIATO Manuel BMC s.t. 81 BELKOV Maxim KATUSHA s.t. 82 VERONA Carlos ETIXX-QUICK STEP s.t. 83 MOSER Moreno CANNONDALE s.t. 85 VISCONTI Giovanni MOVISTAR s.t. 86 BRANDLE Matthias IAM CYCLING s.t. 87 HAGA Chad GIANT-ALPECIN s.t. 88 KOLOBNEV Alexandr GAZPROM-RUSVELO s.t. 89 SERRY Pieter ETIXX-QUICK STEP s.t. 90 BETTIOL Alberto CANNONDALE s.t. 91 MORI Manuele LAMPRE-MERIDA s.t. 93 ERSHOV Artur GAZPROM-RUSVELO s.t. 94 VAUGRENARD Benoit FDJ s.t. 97 HAUSSLER Heinrich IAM CYCLING s.t. 100 FERRARI Roberto LAMPRE-MERIDA s.t. 103 VENTER Jacobus DIMENSION DATA s.t. 106 DUPONT Hubert AG2R-LA MONDIALE s.t. 107 GRETSCH Patrick AG2R-LA MONDIALE s.t. 108 POZZATO Filippo WILIER TRIESTINA s.t. 109 PETROV Evgeny TINKOFF s.t. 110 HERNANDEZ Jesus TINKOFF s.t. 111 SENNI Manuel BMC s.t. 112 NIEMIEC Przemyslaw LAMPRE-MERIDA s.t. 113 ANTON HERNANDEZ Igor DIMENSION DATA s.t. 114 VANENDERT Jelle LOTTO SOUDAL s.t. 116 BOSWELL Ian SKY s.t. 117 MCCARTHY Jay TINKOFF s.t. 119 KOSHEVOY Ilia LAMPRE-MERIDA s.t. 120 BONGIORNO Francesco Manuel BARDIANI CSF s.t. 121 DEIGNAN Philip SKY s.t. 122 BONNAFOND Guillaume AG2R-LA MONDIALE s.t. 123 WARBASSE Lawrence IAM CYCLING s.t. 124 HEPBURN Michael ORICA-GREENEDGE s.t. 126 TIMMER Albert GIANT-ALPECIN s.t. 130 AMEZQUETA Julen WILIER TRIESTINA s.t. 132 LE GAC Olivier FDJ s.t. 133 LAENGEN Vegard Stake IAM CYCLING s.t. 135 LIGTHART Pim LOTTO SOUDAL s.t. 136 DOMONT Axel AG2R-LA MONDIALE s.t. 137 ARNDT Nikias GIANT-ALPECIN s.t. 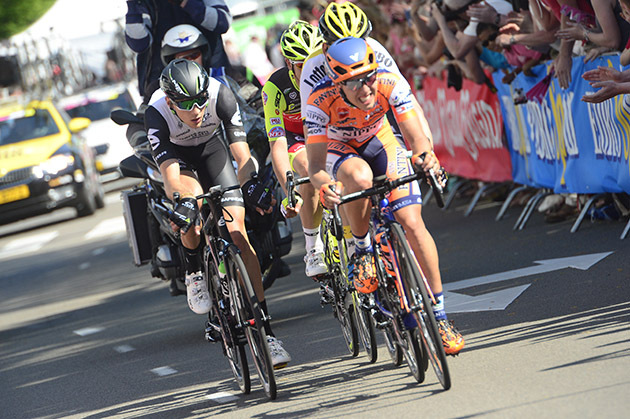 138 STAMSNIJDER Tom GIANT-ALPECIN s.t. 139 ZILIOLI Gianfranco NIPPO-VINI FANTINI s.t. 142 SUTHERLAND Rory MOVISTAR s.t. 144 CICCONE Giulio BARDIANI CSF s.t. 145 LOPEZ GARCIA David SKY s.t. 146 ROSSKOPF Joseph BMC s.t. 148 MORENO Javier MOVISTAR s.t. 149 PLAZA MOLINA Ruben ORICA-GREENEDGE s.t. 150 KOZHATAYEV Bakhtiyar ASTANA s.t. 151 HOWSON Damien ORICA-GREENEDGE s.t. 152 COLBRELLI Sonny BARDIANI CSF s.t. 153 MARECZKO Jakub WILIER TRIESTINA s.t. 154 HOULE Hugo AG2R-LA MONDIALE s.t. 156 OVECHKIN Artem GAZPROM-RUSVELO s.t. 157 THOMSON Jay Robert DIMENSION DATA s.t. 158 BROWN Nathan CANNONDALE s.t. 159 ROELANDTS Jurgen LOTTO SOUDAL s.t. 160 WELLENS Tim LOTTO SOUDAL s.t. 161 SARREAU Marc FDJ s.t. 162 COURTEILLE Arnaud FDJ s.t. 163 NAVARDAUSKAS Ramunas CANNONDALE s.t. 164 KONOVALOVAS Ignatas FDJ s.t. 165 CANCELLARA Fabian TREK-SEGAFREDO s.t. 166 BISOLTI Alessandro NIPPO-VINI FANTINI s.t. 167 DIDIER Laurent TREK-SEGAFREDO s.t. 168 DENIFL Stefan IAM CYCLING s.t. 169 BOEM Nicola BARDIANI CSF s.t. 170 DE MARCHI Alessandro BMC s.t. 172 BOARO Manuele TINKOFF s.t. 173 KEIZER Martijn LOTTO NL-JUMBO s.t. 174 ROGLIC Primoz LOTTO NL-JUMBO s.t. 175 KADRI Blel AG2R-LA MONDIALE s.t. 176 CASTELIJNS Twan LOTTO NL-JUMBO s.t. 177 BOBRIDGE Jack TREK-SEGAFREDO s.t. 178 ZOIDL Riccardo TREK-SEGAFREDO s.t. 179 BOLE Grega NIPPO-VINI FANTINI s.t. 180 FRAILE MATARRANZ Omar DIMENSION DATA s.t. 181 FOLIFOROV Alexander GAZPROM-RUSVELO s.t. 182 GROSU Eduard Michael NIPPO-VINI FANTINI s.t. 183 RODRIGUEZ Cristian WILIER TRIESTINA s.t. 184 RYBALKIN Aleksey GAZPROM-RUSVELO s.t. 185 YAMAMOTO Genki NIPPO-VINI FANTINI s.t. 186 STACCHIOTTI Riccardo NIPPO-VINI FANTINI s.t. 187 JI Cheng GIANT-ALPECIN s.t. 188 FILOSI Iuri NIPPO-VINI FANTINI s.t. 189 CAPECCHI Eros ASTANA s.t. 190 HERRADA LOPEZ José MOVISTAR s.t. 191 ROVNY Ivan TINKOFF s.t. 192 VOROBYEV Anton KATUSHA s.t. 193 JIM Songezo DIMENSION DATA s.t. 194 DOMBROWSKI Joseph Lloyd CANNONDALE s.t. 195 TUFT Svein ORICA-GREENEDGE s.t. 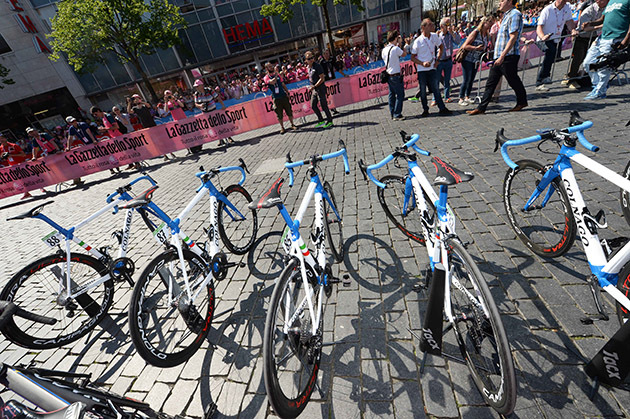 9 HAGA Chad GIANT-ALPECIN s.t. 21 ROCHE Nicholas SKY s.t. 22 CHAVES Esteban ORICA-GREENEDGE s.t. 23 KUNG Stefan BMC s.t. 24 HOWARD Leigh IAM CYCLING s.t. 27 SERRY Pieter ETIXX-QUICK STEP s.t. 28 VISCONTI Giovanni MOVISTAR s.t. 30 URAN URAN Rigoberto CANNONDALE s.t. 32 DEMARE Arnaud FDJ s.t. 33 DE LA CRUZ David ETIXX-QUICK STEP s.t. 34 GREIPEL André LOTTO SOUDAL s.t. 36 KNEES Christian SKY s.t. 38 TCATEVITCH Alexey KATUSHA s.t. 40 PORSEV Alexander KATUSHA s.t. 41 TAARAMAE Rein KATUSHA s.t. 42 MONFORT Maxime LOTTO SOUDAL s.t. 45 PIRAZZI Stefano BARDIANI CSF s.t. 50 WYSS Marcel IAM CYCLING s.t. 51 ERSHOV Artur GAZPROM-RUSVELO s.t. 55 SABATINI Fabio ETIXX-QUICK STEP s.t. 57 BERTAZZO Liam WILIER TRIESTINA s.t. 58 CONTI Valerio LAMPRE-MERIDA s.t. 59 MARTINEZ Daniel WILIER TRIESTINA s.t. 60 FORMOLO Davide CANNONDALE s.t. 62 BRAMBILLA Gianluca ETIXX-QUICK STEP s.t. 63 ROJAS GIL Jose Joaquin MOVISTAR s.t. 64 HENAO Sebastian SKY s.t. 66 BATTAGLIN Enrico LOTTO NL-JUMBO s.t. 72 MOHORIC Matej LAMPRE-MERIDA s.t. 73 COLEDAN Marco TREK-SEGAFREDO s.t. 75 PETILLI Simone LAMPRE-MERIDA s.t. 79 SBARAGLI Kristian DIMENSION DATA s.t. 82 BUSATO Matteo WILIER TRIESTINA s.t. 85 ATAPUMA Darwin BMC s.t. 94 EWAN Caleb ORICA-GREENEDGE s.t. 113 PETROV Evgeny TINKOFF s.t. 115 POZZATO Filippo WILIER TRIESTINA s.t. 144 KONOVALOVAS Ignatas FDJ s.t. 147 ROSSKOPF Joseph BMC s.t. 164 CUNEGO Damiano NIPPO-VINI FANTINI s.t. 174 VOROBYEV Anton KATUSHA s.t. 181 FISCHER Murilo Antonio FDJ s.t. 183 ROVNY Ivan TINKOFF s.t. 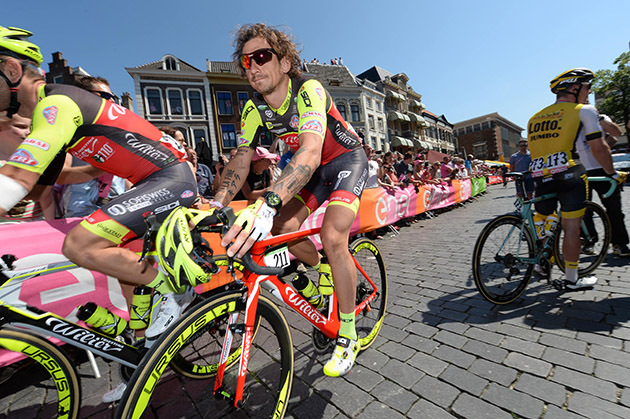 Filippo Pozzato, who turned pro back in 2000, rides to the start line. There was a break, but the sprinters' teams made sure everyone was caught before the finish.